People’s first impressions matter a lot. So, if you want to maintain and improve your home’s curb appeal, here are some great tips to consider. Symmetry is one of those things that makes your home look very prim and proper. It’s much better to have your home look like you’ve put some thought and effort into how it looks that to have it look haphazard. But that’s exactly how it will look if you don’t consider how symmetrical it looks. But this isn’t something that is difficult to get right. It’s just about making sure that you have a good balance of decorative feature on and around your home. If you get it right, it will look organised and pleasant. The white picket fence is a symbol of suburban affluence. So, you want your fence to offer the right welcome to anyone who passes by or approaches your home. You will have to think about what you need to do to maintain your fence depending on the type you have. Different materials require different care procedures. 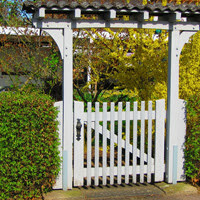 Follow the link to discover some top maintenance tips for powdercoated fences and gates. And if you have a white fence, it will probably need to be repainted every year or so. Not having a front garden doesn’t have to be a huge disadvantage for you. There are plenty of great alternatives to having a lawn and flower bed in front of your home. If you have a decking area or some paving, you can create a makeshift garden out of potted plants. Choose the flowers that fit in with the overall look and colour scheme of your property. You can have some fun with the pots you choose to put the flowers in as well. There are lots of interesting ceramic pots for all kinds of colours and designs. Some houses look really dull and boring when you look at them from the outside. If you want to add some colour to yours, you should consider some window boxes. They will look great alongside the potted plants, and they will give the walls of your home some extra colour and intrigue. All you need to do is buy some iron boxes and will them with soil and then plant some plants in them. As long as you make sure they are in the sunlight and are water regularly, they’ll look great. Artwork does not have to be something that is confined to the inside of the house. Some of the most unusual and interesting pieces of art can be placed in your garden. It could be a sculpture or a water feature. It doesn’t really matter what it is as long as it looks great and makes people look at it. If you do buy one, you will have to make sure that it is suitable for keeping outside. It will need to be weather-resistant. Otherwise, it will just get ruined very quickly. So, have a look at what you can find.